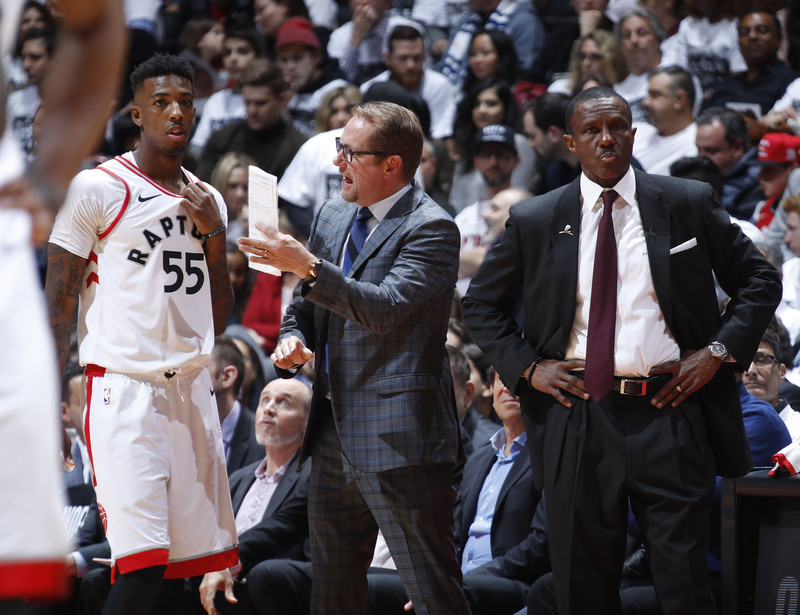 After jettisoning former head coach Dwane Casey, the Raptors were in search of an innovative replacement. 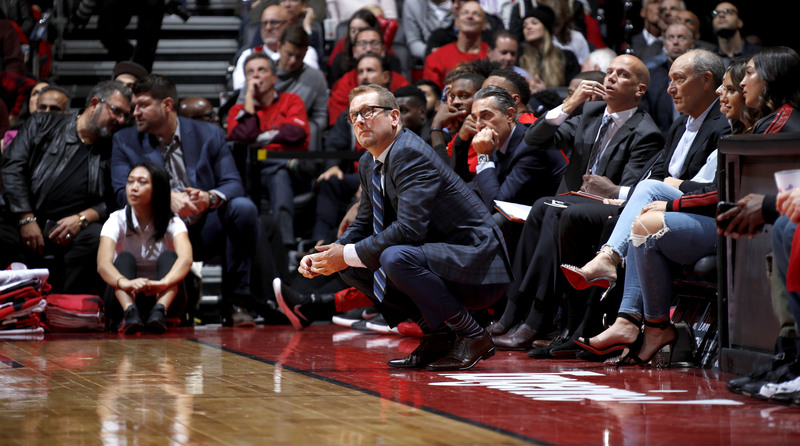 They didn't need to look far for Nick Nurse, who could deliver Toronto's culture reset. Nick Nurse wanted his son to see the Rolling Stones live, before Mick Jagger died. And so briefly after meeting with the Raptors’ top brass about the team’s head coaching vacancy, Toronto’s offensive scientist jetted to England with 14-year-old Noah, unsatisfied until “Satisfaction” blanketed Old Trafford in Manchester. They took a train to London the following morning and toured Stratford-upon-Avon, where they saw a production of King Lear at the Royal Shakespeare Theatre, covering 400 years of culture in 48 hours. “You don’t get much further from the NBA than that,” says Ian Whittell, an English freelance journalist and longtime friend of Nurse’s. Nurse, 51, had emailed his mate months earlier, planning to bring Noah back to the country where he was born, where his hoophead father spent 16 years coaching in an unconventional league—whose alumni are now scattered throughout the pro basketball landscape. The NBA seemed like a distant dream in those days, another stop in a quixotic career that prepared Nurse for his first NBA head coaching job with the Raptors, the call coming from Raptors president Masai Ujiri one week after Nurse’s English excursion. Nurse was visiting his 94-year-old mother in Iowa when he learned that Toronto had acquired Kawhi Leonard, San Antonio’s disgruntled star, in July. Leonard’s apparent desire to join a Los Angeles team in 2019, when he will be a free agent, is now Nurse’s burden. At media day, Leonard deflected questions about where he’ll play next year “If you’re looking into the future,” he said, “you’re going to trip over the present.” He praised the Raptors’ championship culture and claimed winning is the sole way to attract star-caliber players. When asked about his interactions with Nurse, the notoriously taciturn Leonard, said, “[I] spoke to him about the offense and how we can incorporate me into it and just seeing what I can do to make his job easier. Just bouncing ideas back and forth off each other, pretty much, just seeing his schemes and how he thinks.” Those discussions have so far yielded a 5-0 Raptors start with Leonard, Kyle Lowry, Danny Green, Pascal Siakam and Serge Ibaka—Toronto's new starting lineup—boasting the second-highest net rating of high usage five-man lineups so far this season. Nurse’s mindset is apparent throughout his office. A bookshelf overflows with volumes on coaching and leadership. Vibrant paintings of B.B. King, Muddy Waters, Chet Baker and Thelonious Monk adorn the walls. “I think basketball’s like jazz in many ways,” says Rockets general manager Daryl Morey. “You gotta have a structure, but you also need creativity from each of the performers.” It’s now finally Nurse’s job to harness his sidemen, to find harmony between Leonard’s stoicism, Lowry’s tenacity and Jurassic Park’s fervor for an elusive banner in Toronto. Maurey and Marcela Nurse’s nine children all pole vaulted. Each summer, the family wedged two wooden planks into their Carroll, Iowa backyard dirt, piling old mattresses and mounds of sewn-together clothes to form a makeshift landing pit. Nick, their youngest, began practicing as a third grader, barreling down the 40-foot runway. A hoop stood out front, where Nurse honed the shooting stroke that earned him a scholarship to Northern Iowa. A point guard—and a textbook coach-on-the-floor type—Nurse stayed in the program as a student assistant while he finished the 11 credits he had remaining for his accounting degree. Four days later, Nurse was on a plane, making his British Basketball League debut the following evening. After one season as player-coach, Nurse returned to the college ranks, at 23 becoming the youngest head coach in the country at Grand View College in Des Moines. Meanwhile, across the pond, the BBL blossomed. “It was quite the meteoric rise,” Whittell says. Rupert Murdoch’s fledgling Sky Sports network—years before it claimed the Premier League—purchased the BBL’s broadcast rights, which in turn attracted wealthy owners such as Chris Wright, a noted record producer. Teams moved into bigger arenas and drew larger crowds. The league even proved attractive to American players. “Guys would take a lot less money to play where you can speak the language,” says Nate Reinking, who played at Kent State before moving to England and is now the head coach of the G-League Canton Charge. In his hotel room in the Browns Green area of Birmingham, Nurse devoured books on coaching, leadership and strategy. When he found a German company that delivered VHS tapes of NBA games, Nurse requested video of Phil Jackson’s Bulls. “Every Friday, I could hear the guy walk up my stairs, knock on the door, there they were,” he says. “I just watched them over, and over and over again.” He analyzed each game a dozen times, even rolling through the film with his players on the bus to road contests. He implemented an aggressive, attacking defense, especially in transition. “Most people are, ‘Get back, get back, get back!’” says Chris Finch, the Pelicans’ associate head coach who led the Sheffield Sharks at the time. “But he sends guys to the ball.” Nurse and Finch traveled everywhere to scout teams, often spying each other in the stands. “He was clearly one of the best coaches with his work ethic,” Finch says. On Good Friday 1999, Finch and Nurse, now leading the Manchester Giants, met in a game that would decide the BBL regular-season title—valued more by fans as per soccer culture. More than 12,000 fans poured into Manchester Arena. “And it was a walk-up crowd,” Finch says. “That’s basically unheard of.” Sky Sports broadcast the contest on national television. “That was pretty much the high point of the sport,” Whittell says. A back-and-forth battle came down to the final possession: Sheffield holding the ball underneath Manchester’s basket. After seeing Finch’s inbounds set out of a huddle, Nurse called a timeout of his own. A local newspaper photographer captured Nurse scribbling out Finch’s exact play call on a clipboard, but Terrell Myers, a St. Joe’s product and that year’s BBL Player of the Year, curled across a double-screen and drained the game-winning jumper nonetheless. Finch promptly sprinted across the enemy floor, manically celebrating like Jim Valvano. It marked the final chapter of the young coaches’ rivalry. After Nurse piloted his club to the postseason crown a few weeks later, he invited Finch to a Christmas Party that winter, earning an ally as a present. “He’s smart. He’s funny,” Finch says. “He knows how to keep the room loose.” Just a few months later, Nurse finally captured the BBL regular-season crown. Still, Nurse returned to England each fall. In 2001 he joined the Brighton Bears, who had dropped 30-straight games the previous year. Nurse took the team within a buzzer-beater of finishing first in his inaugural campaign. He later acquired an ownership stake, allowing the freedom to let his creativity to run wild. In 2005, after Dennis Rodman was evicted from the British Celebrity Big Brother house—seriously—Nurse inked the 44-year-old to play in Burgess Hill, a tiny 3,000-seat arena. Rodman entered his first of three games off the bench. “The place was going pretty bonkers,” Nurse says. Still running the triangle, a decade after scouting the Bulls on VHS, Nurse saw Rodman in the flesh, immediately flash into the high post and drop a back-door pass for an uncontested layup. The next possession, he drew a charge. “That summed up Nick’s attitude, looking to do things a little different,” Whittell, the British journalists, says. He took the Bears into the ULEB Cup, a 10-game slate with five road games around Europe. Tiny Brighton slayed teams in Croatia, Greece and France—each time the losing club sacked its coach in response. Only not long after, the BBL abandoned its lucrative television deal in favor of an upstart digital network, which flopped just eight months later. “The whole sport really started to unravel at the edges,” Whittell remembers. Nurse flew home to Iowa, unsure of his next step. Gates left Oklahoma to lead the Idaho Stampede in the NBA’s growing Development League when Nurse drove past Des Moines’ new Wells Fargo Arena and inspiration struck. He swerved to the next exit on I-235 and wheeled his car into the arena’s parking lot. Nurse phoned the building’s management from at his steering wheel and later the NBA offices in Manhattan. He enlisted the aid of a local lawyer and political bigwig Jerry Crawford, who chatted up then commissioner David Stern at a function in Phoenix. Des Moines was awarded an expansion franchise. Crawford’s group floated absurd team names to local media, riling Des Moines residents who had no desire to see their new basketball team called the Corncobs or the River Rats. “It got people talking and it got people interested,” says Chris Makris, the team’s general manager, now an executive with the Memphis Grizzlies. Ultimately, the Iowa Energy was born. Nurse and Makris were two of only four employees, and they had a hand in everything—designing jerseys, determining their color scheme, selling tickets, sponsorships and acquiring players in the league’s expansion draft. “Our motto was: if you’re not playing, you’re selling,” says Makris. Nurse appeared on drive-time radio shows and did a tour of Iowa rotary clubs. Nate Bjorkgren, now on Nurse’s Raptors staff, came aboard as a volunteer assistant, joining the team’s practices during his lunch hour as a high school teacher. That first 2007–08 campaign was a slog. Nurse struggled adjusting to the heavy-isolation style, as opposed to the unlocked, free-flowing overseas game. Losing players to NBA call-ups and incorporating assignment players from the team’s two NBA affiliates strained his coaching duties. To counter his roster’s heavy turnover, Nurse spent the following summer creating a three-digit, numerical play-calling system. He found it silly yelling sets every rival knew. “It’d be like Tom Brady coming up and saying, ‘Run up the middle is coming! Run up the middle!’” Nurse says. He converted isolation-leaning players into floor spacers and three-point threats, sometimes running practices that consisted of entirely competitive shooting drills. His overseas experience began paying dividends. Having successfully played smaller lineups against longer, more expensive European rosters, Nurse used 6'7" Cartier Martin as an undersized power forward, and he promptly wreaked havoc on opposing frontcourts. The Energy won the Eastern Conference in 2009–10 and reached the championship in 2011, where Iowa faced Rio Grande Valley—coached by none other than Finch, who had returned stateside to coach in 2009. By the decisive Game 3, two of the Energy’s top players, Othyus Jeffers and Courtney Sims, had departed for NBA call-ups. And in the early minutes of the first quarter, Curtis Stinson, the D-League MVP, suffered a blow to the head, knocking him out of the game. Nurse stood on the sidelines left with only eight players—all earning the league’s minimum salary, $13,000 a year. With a league-record 14,036 fans watching at Wells Fargo Arena, five Iowa players scored in double figures and the Energy overcame a seven-point deficit at the start of the fourth quarter. “It was typical Nick, taking a bunch of guys who weren’t quite good enough, and were in different roles than they should’ve been, and beating a team that had a bunch of guys who either had played or went on to play NBA basketball games,” Makris says. Nurse led the Vipers to the title in 2012–13, which led Raptors coach Dwane Casey to hire Nurse as a Toronto assistant. Nurse’s influence helped open up the offense, and his dry sense of humor eased tensions in huddles. “He finds moments of levity in the middle of a very tense part of the game,” says David Gale, a former Raptors video coordinator. The first head coach Ujiri hired as an NBA executive schemed against him on a British court 20 year earlier. All those global games are behind them. Two red Raptors jerseys hang in Nurse’s office inside Toronto’s practice facility. His surname is stitched into each, curving above the numbers 13 and 18, signifying the years he joined the franchise and became its head coach. Now his journey takes him beyond that framed time span, to a future that Ujiri hopes includes years of sweaty June huddles, with Leonard in tow.